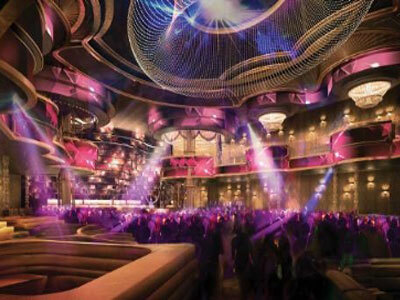 Omnia Nightclub is a breathtaking newer venture into the splashy party palace genre of nightlife. The multi-room club has a variety of sights and sounds, including a roof top garden level with views of the Strip. Modern technology blends seamlessly with the opulence and classic design with luxurious finishes at every turn. From the seductive ultra-lounge to the main room and mezzanine, the club offers guests an extraordinary nightlife destination unparalleled even by Vegas standards. A high-energy DJ lineup is scheduled on Tuesday, Friday and Saturday every week. The star-studded lineup will keep one of the largest dance floors in Vegas filled with partiers. Wild at Heart is a Tuesday concept to release that mid-week energy. A club within a club, Heart of Omnia features its own entertainment and DJ’s. This exclusive ultra lounge is a dark, plush VIP space set off the main entrance to Omnia. I really liked Omnia. The lineup is sick, and if you have VIP you will pretty much be guaranteed a great night! We were not extremely blown away by Omnia, but it was nice. It is very large and does get very crowded. You’re basically standing right on top of people. The music was good. The roof deck facing the strip has an amazing view.